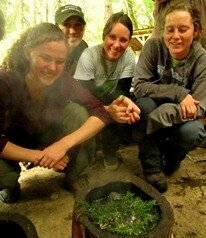 Want to learn more about bird feather identification? 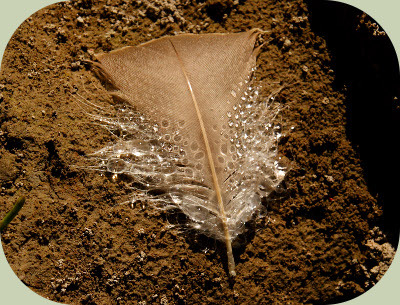 Imagine walking in a wild or not-so-wild place and finding a feather lying on the ground. After admiring its delicate beauty, you might ask yourself: what kind of bird did this come from? To make this challenge easier, it can help to look at some feather basics. This might seem an obvious question, but feathers perform a variety of functions and knowing this can help you learn bird feather identification more quickly. Flight feathers are long, stiffer feathers with thicker shafts. These provide lift and control in the air. Contour feathers include all visible body feathers and provide the bird with several functions including: waterproofing, some insulation and a streamlined shape. These feathers are layered like shingles, underneath which can be found another layer of fluffier feathers such as semi-plume and down feathers. Many birds also possess bristle or whisker-like feathers that tend to be very small, thin and usually located around the face. These little feathers - including both filo-plume and bristle feathers – act like sensory organs not unlike the whiskers of a mouse or cat. When trying to learn bird feather identification, often the most useful feathers to have are those from the wings, body and tail. Flight feathers and tail feathers tend to be the largest, and can give you a sense of the relative size of the bird. While body feathers are the best ones to look at for colors and patterns. Contour or body feathers are generally easy to identify by their shape, which is usually symmetrical on both sides of the shaft and broad at the outer tips. Flight feathers are elongated and asymmetrical to a varying degree. The leading or anterior edge of a flight feather is the narrow side which allows the bird to cut through air. The trailing edge or posterior edge is wider side. Tail feathers have at times a similar appearance to flight feathers, but there is a characteristic unique to tail feathers: the quill, when observed closely from the side has a step down where the bottom of the feather vane meets the quill. Since we are focusing on bird feather identification, we will observe here features of mainly contour, wing and tail feathers. The quill or calamus is the hard lower end of the feather from which it grew and by which it is attached to the skin, not unlike the root of a human hair. The shaft is the continuation of hard structure which continues entirely up the length of the feather. 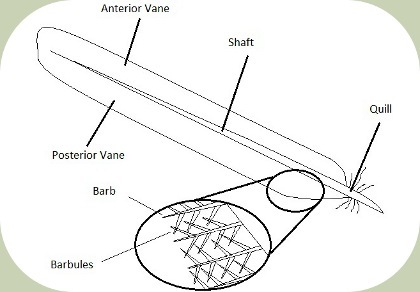 The wispy, soft parts that come off the shaft are known vane, and are made up of smaller parts called as barbs and barbules. Barbs are main branches from which the barbules divide. Tiny hooks called barbicels come off of the barbules and create a dense net-like structure that is visible under a microscope. Bird wings are divided into several major sections, each with feathers that perform specific functions. Primaries are the longest, largest flight feathers and are located on the outer end of the wing. Primaries are often tapered on one or both vanes, creating space between the feathers called slotting that acts to significantly increase lift. Although, the tapering effect on birds with high speed and high-aspect ratio wings is due instead to the overall pointed shape of the wing and primaries may not show much slotting. Along the mid-section of the wing are the secondaries, which are broad feathers often with equal vanes on both sides and a blunt, well-rounded or squared-off end. The area of the wing nearest the body contains a shorter section of flight feathers called tertials, which are basically the last 3 or 4 secondaries. 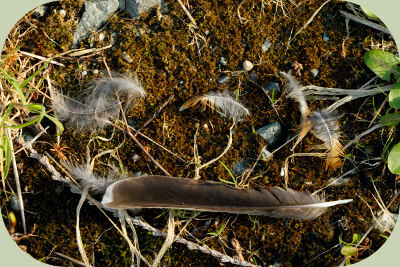 In the area where the first primary feather meets the top of the wing is a small cluster of feathers called the alula. The alula extends from the portion of the wing equivalent to our thumbs, can be manipulated independently of the wing and can be used to increase wing slotting or aid in flight control. The rest of the area across the wing is covered in several areas of smaller covert feathers that give the wing its streamlined shape. Which Part of the Bird is This From? Is the feather symmetrical on both sides of the quill? Does it have a long, tapered end? Or is it squared off or rounded? Is the feather straight or curved overall as you follow the shaft? Looking at the feather from the top, does it have a straight quill or does it kink or angle to one side? Is the tip of the feather pointed, rounded or squared? What sort of patterns or colors does the feather have? Where are they located on the feather? Owl feathers have a thick, velvety fur (really a dense layer of barbs) on them which helps muffle sound. The first few primary flight feathers of owls have a comb-like structure on their leading edge that reduces sound in flight. Hawks and owls commonly have wing and tail feathers that have distinctly bold barring patterns. Primary feathers of ducks are long, thin and have a cupped appearance. Waterfowl in general have a feature on their flight feathers called a "tegmen" that looks like a section of the feather vane has been melted or lacquered. Woodpeckers all have especially stiff tail feathers. The central tail feathers are often very pointed, with the tips tapering noticeably. Their primaries are most often black with white spots. Northern flickers have the most distinctive feathers of all woodpeckers because all of their larger feathers, such as flight feathers and tail feathers have feather quills and shafts that are golden yellow (yellow shafted) or pinkish (red shafted). All doves and pigeons in North America share a particular shade of gray in common on their flight or tail feathers. All gulls have primary feathers that are boldly colored, usually with some combination of white and black. Game birds and birds that camouflage close to the ground like wrens, nighthawks, and poorwills have mottled or barred feathers with a combination of colors like browns, grays, and blacks that blend well into the local ground colors. Waxwings have unique features on their wings: a waxy drop on the very tip of their secondary feathers. This drop is generally reddish or orange. Waxwing tail feathers are also rather distinct, in that they are small, narrow and gray with a bright yellow tip that looks almost as if it has been dipped in yellow paint. Since bird feather identification can be challenging, we recommend you check out some further resources. This article gives only the most basic introduction to bird feather identification. For further information, check out the excellent new book, Bird Feathers: A Guide to North American Species written by Alderleaf instructor, Dave Scott. It is the first and only field guide dedicated solely to the identification of feathers. The guide is richly illustrated with nearly 500 color photographs and explains how to use feather type, shape, and color to identify the species a particular feather came from. This is a valuable, information-packed resource for birders, biologists, and nature lovers.